Here is a resource I will be using to help students learn and review the nature of science topics in Unit 4 – Cells (Topics 1.1, 1.2, 1.3, 1.4, 1.5). This is an important topic for the Nature of Science, as the osmotic potential prescribed practical and Davson & Danielli have made multiple appearances on past exams – this is clearly an area to watch! Here are some flashcards I put together on Quizlet identifying the scientists that are mentioned in the NOS. While it is unlikely that you would have a question asking you to name a specific scientist or the conditions under which their work took place, it is definitely helpful to be able to link names to topics and to their area of work. This is definitely a post for teachers! We recently had some fantastic PD at school with Dr. Gini Rojas focusing on ELL: English Language Learning. What was particularly useful were the range of strategies shared for developing and extending language skills in all classrooms – even IB Biology! It does not take long for an IB teacher (or student) to realise that one of the keys to success is understanding the language of the exam, in particular determining exactly what it is that the question is asking. Students need to be able to triangulate the Command Term, question and the number of marks, as well as interpret any additional information provided, in order to submit the appropriate response. For English Language Learners, this can be especially challenging. Based on a conversation with a colleague, I had a quick analysis of the word count of HL Paper 2 for 2014 (May TZ1 and TZ2 and November) and related it to the types of questions on the paper. The results, while not definitive, do give some interesting indications of areas to focus on during class. 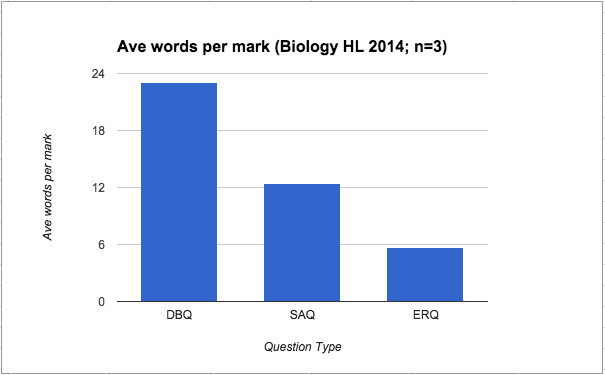 The figure below shows that the average number of words in the Data-Based Question section (DBQ) are considerably higher than the other two sections (Extended Response Questions – ERQ and Short Answer Questions – SAQ) of paper 2. This is not surprising when you consider the additional information included with this question. Ratio of word number to marks available. The second graph shows the average number of words per mark on the papers. Again, the amount of words needed per mark are far greater for the DBQ than the other two sections. So what, if anything, does this “back of the envelope” calculation tell us about exams? The DBQs require the least preparation in the sense that they are based on unseen information. Often, the best way for students to prepare for them is to practice as many past DBQs as possible. But looking at the language and format, there are definitely some areas that students can specifically work on in order to improve their marks. As they are worth 18 marks in HL P2, which equates to approximately 9% of their final IB Biology Grade, it is important that some thought is given here. One of the most important things to understand are the Command Terms. While they are no longer emphasised as much in the new syllabus, they are still the key to performing well on Paper 2 and 3. These are Tier 2 vocabulary words, meaning they have different meanings in different subjects. Knowing the difference between “Explain” and “Evaluate” in a biology paper could be crucial. Practicing with sentence starters linked to the command term is one way to do this, especially for EAL students. Matching Command Term to definition is an easy formative quiz topic as well. There is much more to talk about here; I will try to put together another post before the exam season starts. Please send any comments about how you prepare your students for DBQs; students feel free to ask any questions. Sweetwater District-Wide Academic Support Teams. 2010. Academic Language Function Toolkit. Web. 8 March, 2016. This links to Practical 2: Estimation of osmolarity in tissues by bathing samples in hypotonic and hypertonic solutions. This links to Practical 3 – Experimental investigation of a factor affecting enzyme activity. 9.1 Transport in the xylem of plants Use models as representations of the real world—mechanisms involved in water transport in the xylem can be investigated using apparatus and materials that show similarities in structure to plant tissues. This links to Practical 7 – Measurement of transpiration rates using potometers. With a bit of planning, a single lesson can combine content, practical work and the Nature of Science. Further, linking NOS to an experiment can help reinforce understanding in a much more effective way. As you begin to work towards the IA, these then provide additional inspiration for students to develop their own investigations. In terms of preparing for examinations, students should draw on their experience with these practical experiments. This looks especially important for the new Paper 3, which includes a Section A with unseen data based on the core/AHL syllabus, but could also be important on the other papers as well. Outline the importance of collecting adequate quantitative data when conducting osmosis experiments/measuring the rate of reaction in enzyme experiments. Remember to look back over your experimental notebooks or old lab reports here – this does not require so much in terms of memorisation of facts but rather the process and justification of experimental procedures. Biology Guide: First Assessment 2016. Cardiff: IBO, 2014. Print. The Grade 11 Semester 2 exams are almost upon us! This will be the first formal assessment including the NOS this year, so it is important to think a little bit about how this might work and what exactly you need to know. What this tells us is that you are not expected to memorise dates, names, co-workers, detailed experimental procedures or who won Nobel Prizes. What you need to be able to do is recognise how certain experiments changed the way we view biology and offer evidence of how biology works. For example, you would not be expected to remember that in 1935, the English biochemists Hugh Davson and James Danielli proposed their model of membrane structure and that this was replaced in 1972 by the model devised by the Americans SJ Singer and Garth L. Nicholson. What you would need to remember is that this represents how biological knowledge changes over time and that as new evidence accumulates, theories which are no longer supported must be replaced by theories that reflect the experimental data. This is an example of the falsification of science and is a key aspect of the production of knowledge in the Natural Sciences. In terms of your exam preparation, then, you should focus on the description of the NOS, which is displayed at the top of each blog post. You should understand in broad strokes how the particular individual or experimental technique mentioned relates to that statement. You will also need to link the NOS to the syllabus content; for example, the Davson-Danielli NOS might need to be linked to the structure and function of the plasma membrane. The idea here is that this should be approached form a process perspective, rather than focusing on content – you have enough to do of that as it is! IB. Biology teacher support material: First assessment 2016. 2014. IBO; Cardiff. Print.